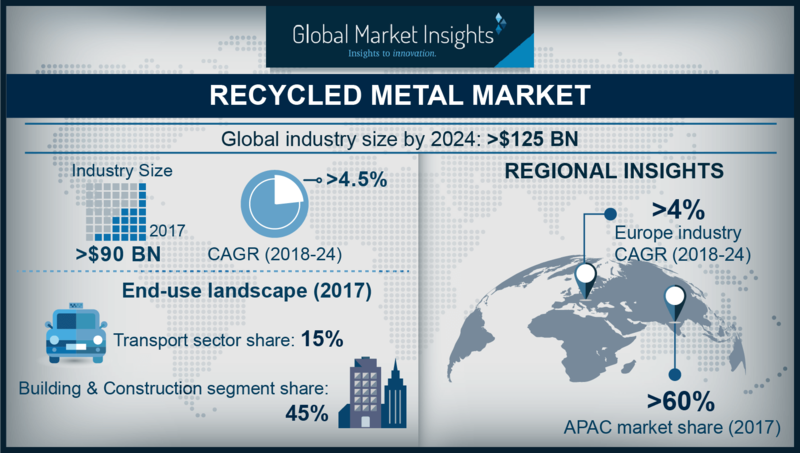 Riding on the hallmark of waste management, global recycled metal market has received a tremendous upsurge in the last couple of decades on account of the increasing awareness among regulatory bodies and metal companies regarding scrap metal recycling industry trends. Indeed, scrap recycling has now emerged as a pivotal trend across major industries in order to fulfil the goals of curbing landfill utilization, cost reduction, and efficient resource management. Recycling metals is also known to contribute to reducing waste, eliminating the destruction of habitats from mining operations, saving resources, and decreasing pollution, in consequence, generating a positive scenario of sorts for the expansion of recycled metal industry. Scrap material is essentially a continuous source of metal from old buildings, bridges, automobiles, airplanes, and appliances. It is thus rather discernible that the remarkably expanding construction and consumer electronics sectors, in addition to the automotive metal market will have a notable influence on the overall recycled metal industry share. Though the metal recycling process is complex and requires advanced processing techniques, considering the economic, energy conservation, and environmental benefits it offers, companies involved in metal recycling activities have been proactively investing in the same. Essentially, metals to be recycled fall under the ferrous and non-ferrous category. As a matter of fact, ferrous metals primarily comprising steel is one of the most recycled metals across the globe. Estimates claim that ferrous metals accounted for 85% of the recycled metal industry share in 2017. Ferrous metals are majorly deployed in vehicle parts – in locomotives, automobiles, ships, and construction materials. Having recognized that a balance is required to be maintained in the supply-demand chain in order to retain an equity between raw material resources and investments, ferrous metal suppliers and product manufacturers, particularly steel manufacturing companies, have been adopting scrap metal processing as an integral part of their production chain. This is essentially because as compared to ore extraction, the use of recycled ferrous metals remarkably reduces air pollution, carbon dioxide emissions, energy and water consumption. The shifting trends toward the increasing use of recycled metals will thus aid the numerous countries that are primarily dependent on ferrous metal imports, to become self-reliant. By extension, scrap metal recycling industry is likely to thrive commendably from ferrous metal recycling in the ensuing years, thereby augmenting recycled metal market trends. In the U.S., municipal solid waste (MSW) is one of the prominent sources of ferrous metals which is found in appliances, tires, packaging, containers, and furniture. As per estimates compiled by the United States Environmental Protection Agency (EPA) and Steel Recycling Institute, in 2015, nearly 18 million tons of ferrous metals had been generated out of which more than 60% of ferrous metals had been recycled. Over the few last decades, in line with the increasing population in the urban areas, the level of municipal solid waste has been rising tremendously. In consequence, most of the regional governments have been implementing programs to support solid waste disposal for maintaining the sustainability of the materials. The successful deployment of sustainable material management policies across the globe will have a notable influence on ferrous scrap metal recycling industry in the years to come. Currently, a million tons of non-ferrous scrap are generated from refiners, smelters, foundries, and ingot makers in a year. This could prove to be rather fruitful for recycled metal industry contenders, as they have been looking forward to improvising on the unrestricted flow of non-ferrous scrap across the globe owing to the inadequate availability non-ferrous materials such as aluminum, cobalt, nickel, zinc, lead, copper, and other precious metals. Incidentally, among all the commonly used non-ferrous metals in various applications, aluminum seems to be the one that is recycled most often, despite the fact that it is obtained from the earth’s crust on a large scale. The reason behind the same can be attributed to ecological balance and energy efficiency, since aluminum is found extensively in durable and non-durable goods comprising appliances, cans, and furniture, that are used on a humongous scale by the masses. As per statistics compiled by the Aluminum Association Industry, in 2015, 1.4% aluminum was generated from the total MSW generation that year – the figure stood at 3.6 million tons, 1.8 million tons of which were from containers and packaging, while the other 1.8 million tons were attributed to durable and non-durable goods. In addition, the total recycling rate of aluminum scrap from food containers, beverage containers, foil, and other aluminum packaging was found to be over 35%. It is thus rather overt that the excessive deployment of aluminum across a plethora of applications is the sole factor responsible for the metal being one of the most recycled ones. The robust usage of non-ferrous metals will thus be directly proportional to their reprocessing in the scrap metal recycling industry. The shifting focus of players in the recycled metal market toward ever-expanding scrap metal business has indeed added an appreciable impetus to the industry growth. In order to tap the rising number of business opportunities with respect to non-ferrous scrap metal processing solutions, most of the companies have been working to expand their regional reach by establishing material processing facility centers. For instance, recently, the U.S. based Dynamic Lifecycle Innovations Inc. has opened a new metal processing and recycling facility spanning 140,000 square feet. This newly developed facility has the capability to process complex materials including non-ferrous metals and precious metals which are difficult to recycle. The company is planning to innovate new recycling technologies to deliver excellent processing solutions to the customers. This testifies that aided by superior scrap metal processing capabilities, recycled metal industry players are likely to increase their vendor base. In yet another instance, a few months before, a Germany-based provider of precious metal services, Heraeus Precious Metals, commenced a precious metal recycling facility in China with an investment of USD 120 million. This 84,000 square-meter plant will recycle approximately 3,000 tons of precious metals. As China is one of the major revenue pockets of APAC recycled metal market, this step undertaken by the German company to establish a metal scrap recycling plant in China, will prove to be rather lucrative for its expansion in the region. Incidentally, in 2017, Asia Pacific accounted for 60% of the overall recycled metal industry share. The rise in metal recycling facilities across the globe has mainly been met with mixed critical reactions. Long-term exposure to metal recovery chemicals and gases has been having a negative impact on employee health. In accordance, regulatory bodies like the Occupational Safety and Health Administration (OSHA) have been mandating norms for scrap metal processing industries that entail them to deploy safety measures while developing new facilities. Scrap industry players have thus been looking forward to installing advanced scrap metal processing technologies on a large scale, while adhering to the set regulations. The surging involvement of companies to deploy modernized and next-generation facilities to reduce human intervention will also emerge as another driving factor for recycled metal industry. In essence, powered by the increasing use of scrap metals for economic viability and energy conservation, the overall recycled metal industry will surpass a revenue collection of USD 125 billion by the end of 2024.